SNES Metal Max Returns (JPN) in 30:58.86 by suwei. Metal Max Returns is the remake of the NES game Metal Max. 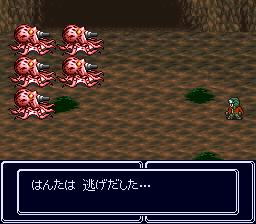 It features better graphics and sound, revised areas, references to Metal Max 2, and slightly decreased difficulty. Because of the requirements for completion in this game, this movie is quite different from the original Metal Max (which was TASed by the same author, suwei). For a list of the differences and more information, see the author's notes. The YouTube encode contains commentary from the author in the form of captions.